So many of you enjoyed Dr. Robert Brooks‘ Keynote during ShiftinEdu. Here is a touching article on loneliness. He discusses the importance of connections, showing empathy, and helping others, not only for our students but for ourselves in the workplace. If-Then stories are a fun way for students to think creatively and strategically. They can brainstorm different ways readers might interact with a story. Below is just one part of the course to show you how easy this can be done! Of course, you are welcome to go through the whole unit! Patches is a free online tool to create your own drawn animated virtual reality scenes. Students could use this VR tool to create fiction stories. In Math, this tool can be used to sharpen geometry concepts. 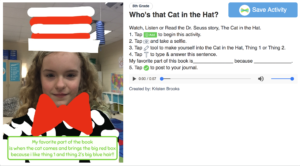 Kristen Brooks created this easy and fun activity for Seesaw and it’s ready for you to use. You can use the hashtag #DrSeussWeek and #ReadAcrossAmerica.